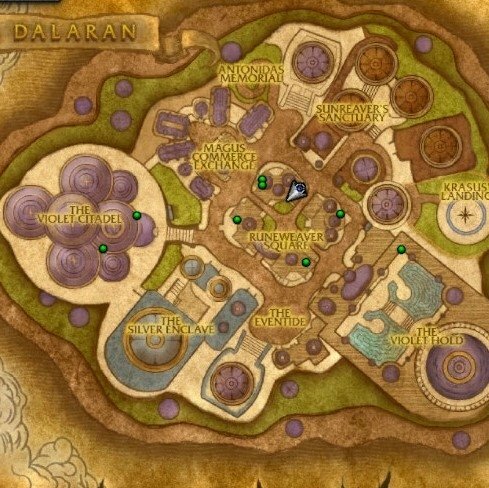 Places pins on the World Map and Minimap for all eight Higher Learning book spawn locations in Northrend Dalaran. Each pin may be individually customised. High precision coordinates appear in Tooltips. Location descriptions and timestamps are also included. Minimap Options: Left Click or Shift Left Click on a pin to change the pin texture. Each click cycles forwards or backwards through a list. Changes will also appear on the World Map. Applies to a single pin only. Excellent for fast marking of visited locations or locations where a book was found. 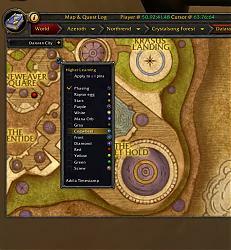 World Map Pin Options: Click on a pin. A Drop-down menu appears. You may select a texture for that pin or apply the texture to all pins. Changes will also appear on the Minimap. 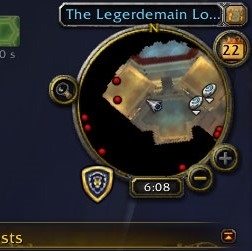 World Map "Magnifying Glass" Options: Click the button in the top right of the World Map. Check boxes allow you to show/hide the book pins, coordinates and the playing of sounds. 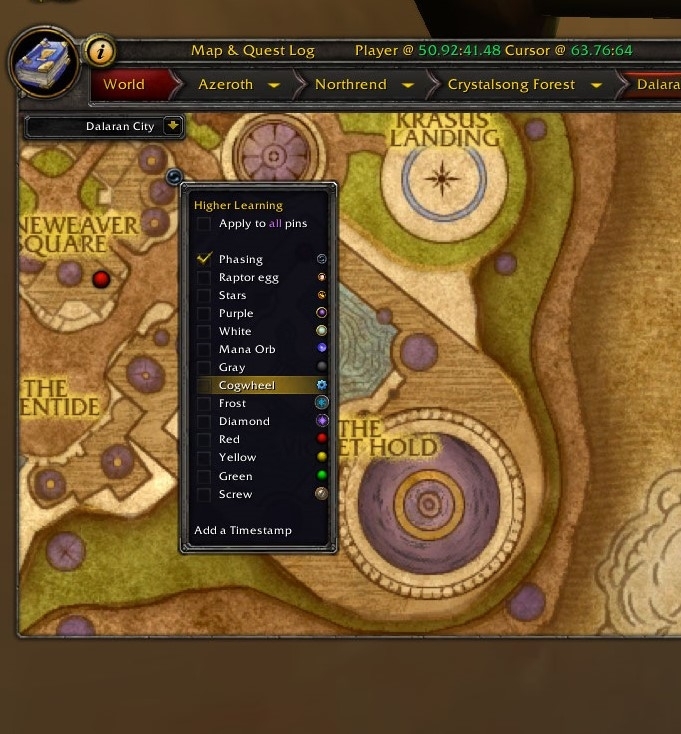 There are options to reset all individual texture settings, erase timestamps and to jump to Northrend Dalaran, as appropriate. 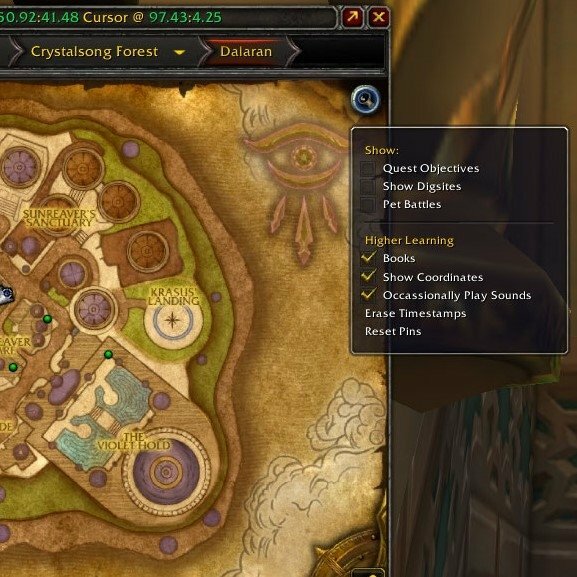 Changes will also appear on the Minimap. Command Line: Enter '/hl', '/higher', '/learning' in chat. Use '/hl s 20', '/hl s 40' (for example) to change the pin sizes. Chat Links: Activate the edit box of any chat channel. Hold down the CTRL key. Move the mouse over a pin. "Higher Learning", the book type and coordinate data will be pasted to your chat channel. Just hit ENTER to send! There are 8 possible spawn locations for books in Dalaran. Each location has an individual timer of between 1 and 3 hours. If a book has spawned it might not be the correct book. Each location is home to just 1 of the 8 books and those books never change location. Once you have clicked upon a book, whether that book is a Higher Learning book or not, the book will despawn in 3 minutes. Time enough for several of your characters to click upon the book, if you so wish. When all 8 books have been "read" or clicked, you will receive some mail from the NPC Ronin. It will contain an item. 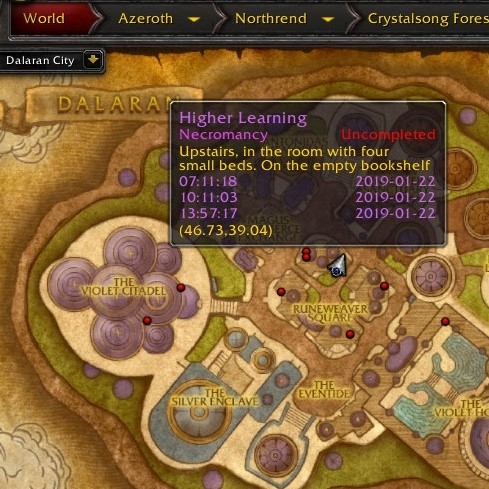 Use that item to teleport to the top of the highest mage tower in the Violet Citadel. Speak to Archmage Vargoth. He will reward you with a something lovely and familiar! To avoid spoilers do NOT click these links. Snazzy! One improvement: there is no such word as "Uncompleted", as found in your tooltip. I suggest using Blizzard's global string INCOMPLETE instead. It is line 7986 of GlobalStings.lua, and you can drop it in just as I typed it, all capitals. Many thanks. Embarrassing. I used to lecture / teach English Grammar / Writing. Let's agree between the two of us that this didn't happen? Nobody will know! Edit: I had a poke around the massive list of global strings. I went with CRITERIA_COMPLETED and CRITERIA_NOT_COMPLETED as I was more comfortable with the translations. Thanks again. I'll get this uploaded soonish. Last edited by Taraezor : 02-07-19 at 03:11 AM.